We have moved to another home base today. We are staying in a vintner's B&B for two days. The home is adjacent to the town of Beaumes de Venise in southern France. We took a walk in the town to get a taste of this old village. We walked up to the top of the hill where the first inhabitants lived in the 12th century. 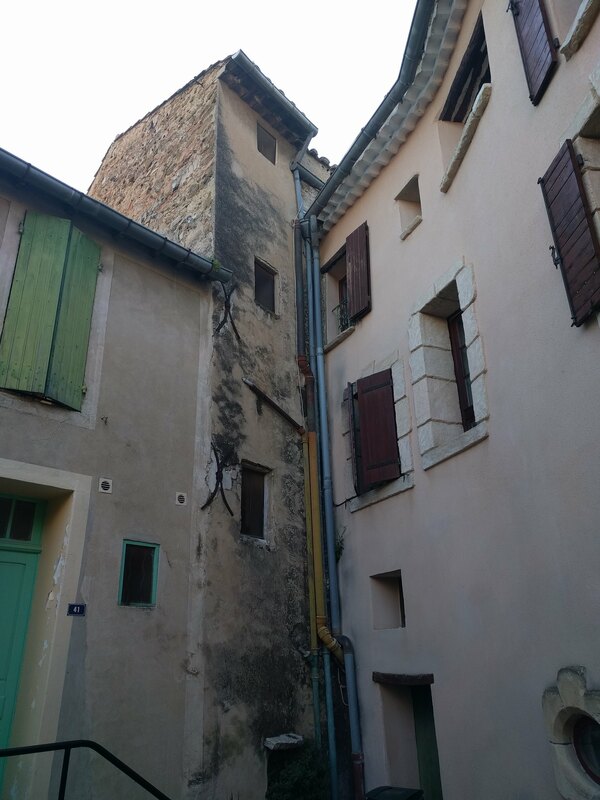 As we strolled through the narrow streets, we noticed that the older homes were not torn down to make room for the new but the new fit in with the old. Or, in some cases, were never modified at all. We met a family that are living in a three-story stone home that was built in the 15th century. Little has been done to modify the structure. Only a few conveniences to make life a little bit more comfortable. I wanted to ask them if they knew anything about former tenants, so I said, "There have been a lot of people that have lived in your home." They replied, "Oh yes, but no ghost." It made me think of Downey and how we tear down the old to make room for the new. We don't use our imaginations to preserve the old and meld the new in with it. "Architecture has been called the art of building beautifully, a fixation of man’s thinking, and record of his activity… Keep in mind that last phrase. It is important."